Missouri's governor planned to tour damaged areas Saturday as residents in parts of the Midwest clean up from powerful storms that splintered homes, knocked out power to thousands and left four people dead. Hundreds of homes and businesses were damaged or destroyed in the storms Friday in Kansas, Kentucky, Illinois and Missouri that also left 150,000 customers in Missouri without power at the height of outages. Missouri Gov. Jay Nixon declared a state of emergency. "My primary concern is the safety of Missourians and this executive order makes state agency resources available to help communities respond to the storms," Nixon said. Two people were killed near Poplar Bluff, Mo., when wind knocked a tree onto their sport utility vehicle. In Dallas County, a man in his 70s had a fatal heart attack after he and his wife were sucked from their home by a tornado and thrown into a field 75 to 100 feet away, said county emergency management director Larry Highfill. The wife was taken to a Springfield hospital and was in fair condition late Friday. A mobile home was blown off its foundation in southeast Kansas, killing a 54-year-old woman inside. Wind in the area reached 120 mph, destroying the New Albany United Methodist Church, the town's post office and at least one home, authorities said. Major damage also was reported to a high school in Cherokee, Kan.
National Weather Service offices in Springfield, Mo., and St. Louis received multiple reports of tornadoes from one end of Missouri to the other, mostly south of Interstate 44. The weather service confirmed that at least two tornadoes touched down between 8 a.m. and 8:15 a.m. in southwest Missouri's Greene County. The county's Office of Emergency Management counted three homes and one business destroyed with 298 homes, 29 businesses and 13 schools damaged. In southern Illinois, the storm system peeled siding and roofs off homes and other buildings, blowing out car windows and tearing up trailer parks. Carbondale Township fire Capt. Mark Black said he wasn't sure if a tornado touched down in his area but the "winds were just amazing. They were howling and the siding on the trailers was flying through the air and there was a pretty hard rain." Seeley said the strong line of thunderstorms began moving through the region Friday morning. Wind gusts in the Carbondale area reached 100 mph around 1:30 p.m., and sustained winds were as high as 90 mph. Carbondale resident Eric Fidler said he rode out the storm in a basement room with his wife, 22-month-old daughter and their dog. When they emerged, dozens of large, old trees had been snapped throughout his neighborhood, but there was little damage to homes. "I was talking to a neighbor and saying, 'This is just incredible. Everywhere I look, there are enormous trees down, but it missed everybody's house,"' said Fidler. In sparsely populated Dallas County, Mo., seven people were hurt as wind destroyed 35 homes and damaged numerous others, state emergency management officials said. Highfill said all the damaged homes were in the same path, a strong hint that a tornado was to blame. In Kentucky, one person was killed after a strong thunderstorm moved through the central part of the state, an emergency management official said. The woman's body was found in a pond, but officials didn't immediately release further details about her death. Winds destroyed several homes in Madison County, said Michael Bryant, the county's assistant deputy emergency management director. "Devastated, shocked," said Wade Hall, whose parents, Lonnie and Ann Hall, were headed to the basement when the walls of their house in the county collapsed around them. "You lose everything you work for." The county has declared a state of emergency and Kentucky national guard troops were en route to help with the aftermath, he said. The National Weather Service office in Birmingham confirmed at least eight tornadoes touched down across counties in north-central and west Alabama. 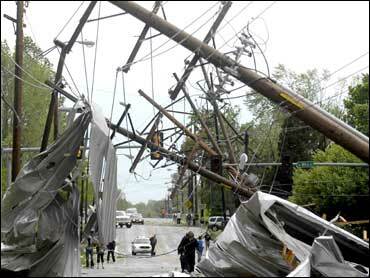 Survey teams canvassed storm damaged areas in north-central and west Alabama Wednesday. The NWS said twisters cut a path of destruction through Walker County, where 3 tornadoes were confirmed. Others counties hit by the severe weather included Blount, Pickens and Tuscaloosa counties. Forecasters in Huntsville said a tornado caused sporadic property damage in Madison County.